Just a reminder for those of you who use Twitter. You can now find me on Twitter @drknapp83. Of course, you can often find new pictures and updates through both Twitter and Facebook as well. Check them both out! In the meantime, I'm off for the mountains for a few days. I'll check back in late Thursday or Friday before I head out again. NOW is the time to be out there! I still have some limited availability for next week (October 26-31) and some prime days in the first two weeks of November. Now is the time to get out and fish. The trout are feeding like they are about to run out of food which is sort of what is about to happen. Winter is a lean time in the mountains so get out now while the food is available and the fish are happy and fat. I've seen more big rainbows caught in the last month than during the whole rest of the year. Large browns will be turning up now as well so don't delay your trip! If you are interested in a trip next week, send me an email and make sure to include a phone number or better yet call and leave me a voice message. Finally, if you have not heard about Fly Tyers Weekend yet, start planning now to be there. It is going to be an incredible gathering of talent. Even if you don't tie this is a don't miss. I still have some openings in the days leading up to the weekend so contact me ASAP if you need a guided trip. Historically, fall is the driest season here in middle and east Tennessee. In fact, October is the driest month climatologically speaking. More often than not, however, we usually see at least one good high water event in the fall season. The worst ones are when it blows out the spawn up in the Smokies. 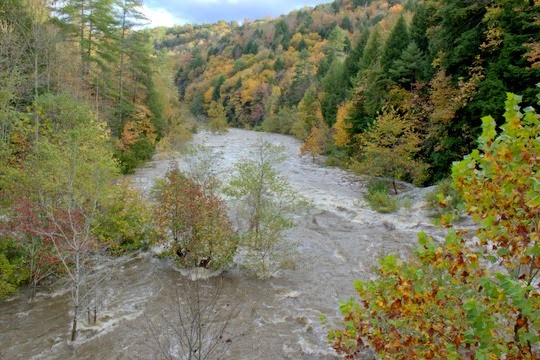 The wild brown and brook trout need all the help they can get, and a serious high water event can practically wipe out an entire age class. This year we got lucky. I'm sure my clients who had trips cancelled would be glad to argue that point, but the fish will definitely be in good shape this year for the spawn. With some areas receiving over 5 inches of rain, area creeks, streams, and rivers were really rolling by the middle of this week. Little River peaked at over 8 feet on the Townsend gauge which is in the vicinity of flood stage. When normal this time of year is under 2 feet, you can imagine that we are talking about a lot of water. With all the streams blown out and unfishable, I decided that a drive up to Clear Creek would be a great idea. The chance to see both the fall colors and the high water was just too tempting. Sure enough, the river was higher than I have ever seen it, although to be fair I don't normally drive up there to look at high water. Still, the normally tranquil stream was up in the trees and generally looking quite dangerous. The colors were nice as well. We are very close to peak colors here in the Cumberland Plateau and should see the best of fall during the next 2 weeks. Some spots have already reached their peak but there are still plenty of colorful trees to enjoy. 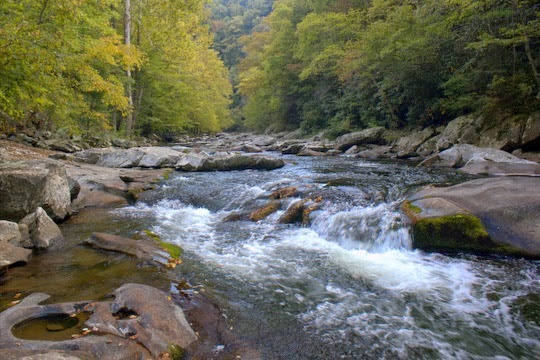 Anyone who has fished the Smokies knows that you don't come here to catch big fish. Yes, there are big browns around, even some true monsters, but few people ever see them much less catch them. The rainbows, on the other hand, provide the bulk of the entertainment unless you travel up high in elevation searching for brookies. This year, I've been privileged to catch some really nice rainbows. In fact, within the last month I've caught personal bests for the year twice! The first one was 12 inches almost exactly. I know, that doesn't sound like a very large rainbow. Everything here is relative. On the Caney Fork which I also frequent, a 12 inch rainbow is normal, one of the standard put and take rainbows that are constantly being dumped in to keep the catch and keep crowd happy. In the mountains, well let's just say it doesn't happen every day. That's why I was so surprised when I caught an even larger trout just last week. The story actually begins the day before with me waking up at an unearthly hour to head over to Little River Outfitters for a couple of days working in the shop. As I headed out of the house and down the mountain towards Knoxville, I started contemplating my options for fishing after work. Each week, I've attempted to scratch a different itch. 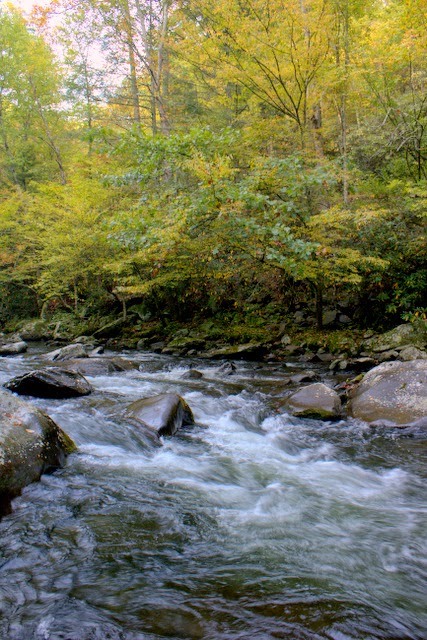 Once or twice I've chased brookies up high, and once I even made the dreaded drive into Cades Cove to fish Abrams Creek, not because it is the best place to fish, but more for old time's sake. I used to fish it often many years ago. Lately I just can't stomach the traffic getting there. By the time I got to work, I was still trying to decide where to fish, but did have it nailed down to one of two stretches on Little River. The evenings are arriving earlier than ever with the changing seasons and I didn't want to waste time driving up the mountain for brookies or hiking up high above Elkmont. Fast forward a few hours and it is nearly time to get off of work. I've made a major strategic decision regarding my evening fishing. Normally I'll get to the stream and evaluate what is happening stream side before determining how I want to fish. Without rising trout and an obvious hatch, I'll usually go with a nymph rig of some sort to maximize my success. On this particular Thursday, I decided that I just wanted to have fun. Right now you're probably scratching your head. Isn't all fishing about having fun you ask? Yes, but there is fun because I'm catching fish and then there is fun because I enjoy how I'm fishing. The two often go hand in hand but not always. For my fun on this day, I decided to fish a dry fly. While I hoped that would be enough, I was still hedging my bets by dropping a small bead head behind the dry. On my way up Little River, my car just sort of eased itself off at the first place I was thinking about fishing so I took that as a sign that I should fish there instead of heading further upstream. My preparation was fairly simple and before I knew it I was down on the stream casting. There were some small trout rising in the pool in front of me but they seemed unusually wise for their size. Moving up into the pocket water, I soon found more willing candidates. The rainbows on Little River are gorgeous. This time of year their large pink stripes seem to stand out more than ever, like they are dressing up for the fall season along with the browns and brookies. Colorful trees around me made the moment even better. Moving up the creek, I found good numbers of willing trout, although nothing of any size. The dry fly was a big orange Elk Hair Caddis I tie that mimics the big fall caddis that we have in the Smokies. The dropper was a #16 Zebra Midge. Both caught fish, although the larger fish did seem to have a preference for the dropper. The leaves continued to awe me with their colors as well so my camera saw a fair amount of action. Climbing out of the river before it got too dark, I was soon back at the car. Instead of breaking down my rod, I just left everything strung up to fish the next morning on my way in to work. After a pleasant evening in camp at Elkmont relaxing, I hit the sack a bit early and before I knew it morning had arrived. Throwing all my gear in the car, I was all packed and ready to fish before I knew it. Noticing the dry/dropper rig from the previous evening, I decided to leave it on not knowing what a great choice that would end up being. There is a pool, somewhere on Little River, that is a favorite of mine. This is more due to the fact that you can see into it so well than anything. It may get fished more than any other pool on the entire river so the fish are often skittish. If you arrive first thing in the morning though the fish can be caught with a healthy combination of luck and skill. With limited time before I had to arrive at work, I started in the middle of the pool and worked my way towards the head. Before long I was admiring a seven inch rainbow and was pretty content with my morning. By the time I had tricked another fish, slightly smaller at six inches, I was getting concerned about the time. A quick check revealed that I still had twenty minutes to fish so I moved all the way to the head of the pool and started working the bubble line with my offering. When the dry darted under and the line came tight, I quickly realized it was a nice fish. 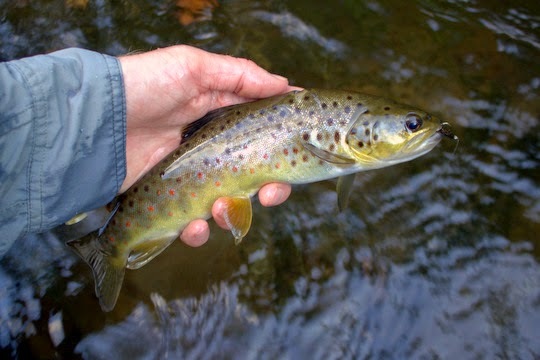 Expecting the golden hues of a brown trout's side, I was surprised to see a big pink stripe. Thankful I had a net with me, I quickly worked the fish away from all obstacles and into open water. When the fish finally gave up the fight and allowed me to slip the net under it, I was one happy fisherman! The nice rainbow definitely made my morning and measured between 13 and 14 inches. 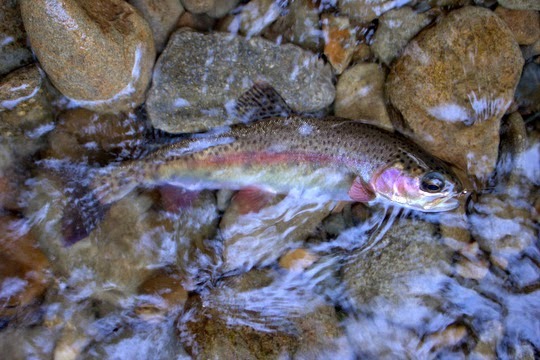 Not the largest rainbow I've caught in the Park, but easily in the top 5 for wild rainbows I've caught in the Smokies, the trout was a perfect way to start my morning. I still have a nagging suspicion that if I had been fishing my usual deep nymph rig the fish would never have been caught. I guess it is good to just go out and fish for fun sometimes instead of taking things too seriously. 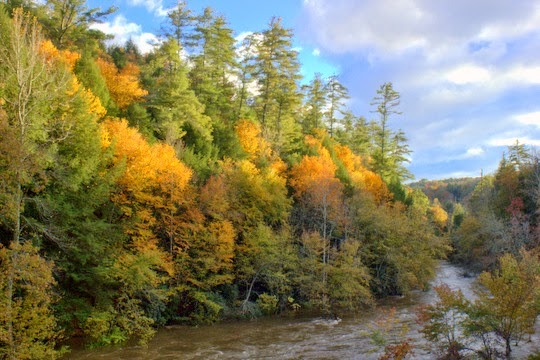 Yes it is early, much earlier than some years, but the fall colors in the Smokies are already reaching their peak. In fact, up high near Newfound Gap, I would say that we have already passed the peak for the most part. The mountains are a patchwork of color, with some slopes apparently being cooler than others, and thus the colors are more advanced in some areas than others. Along with the nice colors come large numbers of tourists. Lots of those leaves have been falling into the streams as well, but currently the Park streams are experiencing high water so the leaves will be largely cleared out until the next windy day. If you have been planning on visiting the Park to see the colors, do not wait much longer. I've been looking to sell my boat for a couple of weeks now. Having found a good deal on a nice upgrade that will be better for guiding, I have been contemplating selling my current drift boat but time is now short. The other boat I've been looking at will be sold to someone else unless I sell this boat within the next few days. If you've been wanting a boat to get down the local tailwaters this winter, look no further. Here is a link to the Craigslist ad for more information. Email me through that ad or via my contact information on here. Get it before it is either gone or pulled off of the market. Evening trips are accounting for the majority of my fishing, either after guiding all day or after getting off at Little River Outfitters on Thursdays. That works out great because the fishing is generally best early and late right now although depending on the stream and daily weather conditions it can be good throughout the day. The majority of the hatches are happening late and include small caddis, the Giant Autumn Sedges, some Isonychias, and some as yet unidentified mayflies that are bright pink or orange in color. A few Yellow Quills have also been spotted and the midges are both prolific and an all day affair. All of this adds up for healthy and happy fish that are usually willing to eat something. Last week I got out for a few hours in the afternoon after a half day morning guide trip. The fishing was very good for overall numbers. An Isonychia soft hackle was getting it done for me although other flies caught a few as well. Perhaps the best part of the whole afternoon was that moment when I was fishing my way through a nice stretch of pocket water and got a whiff of grapes. Seriously, grapes. I actually ignored my nose at first but then the smell was so strong that I knew I wasn't imagining things. Turning around, I found a rock wall covered in Muscadines. Delicious! A bit later, I found a rather interesting brown trout. It is not the easiest to discern in this photograph, but the fish had some scars around it that appeared to be from tippet/leader material where the fish rolled itself around the line a few times as the angler was fighting it. The evening light was perfect for pictures. Although I spent a lot more time fishing than capturing images, a few I did take turned out okay. These evening escapes are a great way to unwind at the end of the day. You can be sure that the next time I'm in the Smokies, you can find me out on the water in the evening somewhere.